It's hard to describe Extrasolar as a game so much as an interactive experience. As a participant, you'll be exploring dramatic alien landscapes, investigating scientific mysteries, and interacting with real characters as they work to uncover the true motives of the eXoplanetary Research Institute (XRI), a private space agency with a questionable past. "We're inviting you to be a part of this unique, unprecedented adventure." At its core, Extrasolar is a simulated exploration of a nearby planet that plays out in real time. After you upload directions to your rover you'll have to wait several hours for those directions to be carried out and the resulting images to be transmitted back across the depths of space to your web-based terminal. "The eXoplanetary Research Institute (XRI) was founded with a mission to explore..."
Extrasolar rapidly becomes something more, however, as you begin to wonder if XRI is telling you the whole truth about the mission you're participating in. Just who are the people behind the emails and voicemails you're recieving and what are they hiding? What Does It Take To Play? Anyone with a browser and a connection to the internet can play. No special hardware is required to experience Extrasolar. Mobile and tablet devices too, though we are currently working on a version of the game that is better formatted for small screens. Extrasolar is playable from start to finish for FREE. Participants can choose to upgrade their account at any time to unlock certain advanced features. When Can I Start Exploring? Right now! 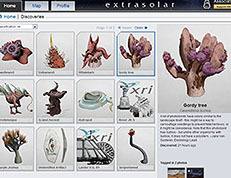 Extrasolar officially launched on February 18th, 2014. To begin, point your browser to extrasolar.com. The planet Epsilon Prime may not actually exist, but for us it exists in a nearly real space: the cloud. Our goal with Extrasolar is to bring an unprecedented level of graphical realism to web games. Our team has gone above and beyond the status-quo, pioneering new technology that allows anyone to take a photo anywhere in the virtual world that we've constructed. The virtual Epsilon Prime follows real rules: a 15.3 hour day, 2 moons with their own lunar cycles, a constantly changing weather system, procedural generation algorithms to create individual unique plants at various stages of growth...all ensuring that every player's experience is unique and no two photos are the same. Lazy 8 is comitted to making Extrasolar a satisfying experience, and one thing that's been important to us is working within the realm of scientific plausibility. All of the science-fiction elements in the game are based on real theories. We've worked with real scientists to make sure the biology of Epsilon Prime is scientifically feasible and to come up with missions and procedures a real science team might pursue when encountering life on another planet. It might be a stretch but we'd love it if Extrasolar served as an inspiration to learn more about life in our universe and the importance of space exploration. Extrasolar is a big game created by a surprisingly small team led by Rob Jagnow -- the developer behind the multi-award-winning puzzle game Cogs. 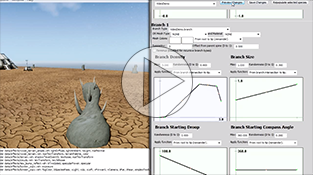 Other contributors include Jonathan Le Plastrier, Brendan Mauro (Cogs), Ryan Williams (Second Life), Lucas J.W. Johnson (The Time Tribe), Keith Turkowski (Everquest) and other talented individuals who have collectively breathed life into the game's extensive universe. We're very proud of our creation and hope you'll enjoy playing Extrasolar as much as we've enjoyed creating it! Some amazing research is currently underway right now at The eXoplanetary Research Institute (XRI). Unfortunately, there's always some crazy person who thinks that every project for the betterment of humanity must be be a conspiracy. You can also follow development updates on the Lazy 8 Blog and discuss the game on our forums.